I’m not a fan of the Jackass TV show (2000-2002) or previous series of films, so I had no high expectations for this new entry. Bad Grandpa is essentially more of the same, except here the troupe go the “hidden camera” approach, getting purportedly real reactions from the unsuspecting people they prank. 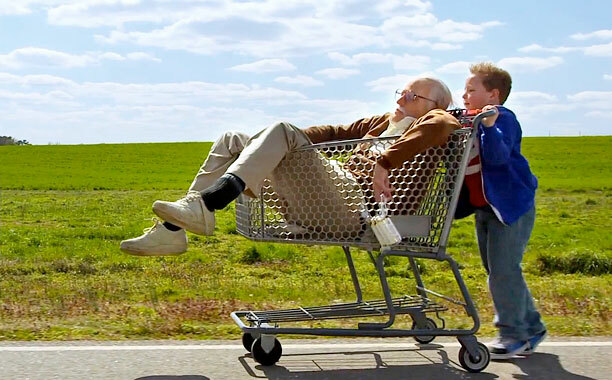 They also add a bit of a fictional narrative to link all the tricks, with Johnny Knoxville playing the titular grandfather and Jackson Nicoll as his grandson. Some of the stunts are fun to watch; I laughed at Knoxville trying to pick up ladies at a male stripclub, and there’s a great scene towards the end where Nicoll dresses up as a beauty pageant girl and dances to Warrant’s Cherry Pie (1990). But an hour and a half of this is just too much, specially when Sacha Baron Cohen does it so much better in Borat: Cultural Learnings of America for Make Benefit Glorious Nation of Kazakhstan (2006) and Brüno (2009). Watch those instead.